I’d agree with MCON’s description of these results being “relatively satisfactory”, with first-half revenue up 11% and operating profit up 9%. MCON’s Q1 statement from May had already admitted the top line was helped by the “impact of [prior-year] acquisitions”, although these results did claim H1 sales were assisted by market-share gains, too. The statement also suggested some hope for further revenue improvement. My sums suggest this Q2 was MCON’s best quarter for revenue and pre-tax profit following the firm’s flotation during late 2013. I like how once again MCON did not present the accounts with an adjustment for seemingly one-off costs — it suggests the executives are conservative with their financial reporting. Anyway, the management narrative accompanying these figures referred to “incurring a €0.4 million charge to reduce head count in operations” — which is not insignificant when the reported operating profit was €4.9m. Bear in mind, however, that last year’s interim statement referred to “one-time costs of €380,000 associated with acquisitions and restructuring”. As such, the underlying operating profit comparison for H1 2016 versus H1 2015 could be €5.3m versus €4.9m. Ignoring the seemingly one-off costs, the operating margin during this first half was 14.6% — quite respectable considering MCON has sizeable exposure to the subdued mining sector. In addition, I was pleased MCON’s gross margins were sustained at 40%-plus throughout the half following the variable performances seen last year. * Acquisitions on hold for now? You may recall MCON declared a bold expansion policy at its flotation, which included spending €10m-€30m on individual acquisition targets. As it happens, the firm has since purchased seven smaller subsidiaries for a total of €10.3m, with a further €6.3m to be possibly paid in future depending on whether certain earn-out targets are met. I applaud MCON’s decision not to overpay for other businesses and to instead develop new products itself. Progress may be a little slower, but the returns on investment ought to be much greater with the sums not involving payments of goodwill ‘premiums’ to former owners. MCON claimed sales from the new products under development ought to start next year. MCON’s full-year results had previously indicated an improvement to the firm’s working-capital management during the second half of 2015. “Inventory has seen some growth since the year end, due to a number of factors including replacing inventory that was previously consignment inventory from third parties, and taking back inventory from distributors being replaced by our own subsidiaries. Raw materials also increased as orders reached a seasonal peak for volumes to be delivered in the second half. The earlier cash-flow statement also flagged expenditure of €3m on new plant and equipment — well above the €1m charged as depreciation. The extra capital expense related mostly to the aforementioned new product development. Following the hefty working-capital and plant expenditure, MCON’s net cash was left €5m lighter at €33.8m — of which €6.3m could still be paid to vendors of past acquisitions. The interim dividend was held at €0.01 per share, which suggests the full-year payout will be €0.02 per share for the third year running. 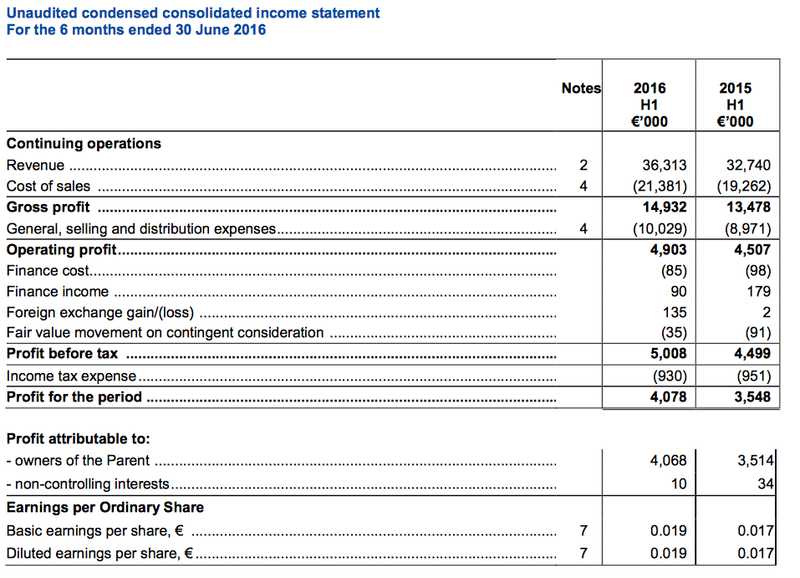 Trailing operating profit now runs at €10.4m, which I suppose with ‘one-off’ costs added back could be closer to €10.8m. The latter figures converts to £9.3m at £:€ 1.16. With MCON’s H1 tax rate at about 19%, earnings could presently be £7.6m or roughly 3.6p per share. Subtracting the effective €27.5m (£21m) net cash position from the £126m market cap, my estimate of MCON’s enterprise value (EV) is £105m or 50p per share. Dividing that 50p per share EV by my 3.6p per share EPS guess therefore gives a multiple of 13.8 at the present 60p offer price. Meanwhile, a maintained €0.02 annual dividend would supply a 2.6% income. Whilst not being as thorough I came to a similar judgement and am surprised at the sp weakness. Probably supports your previous comment that this company needs to do really well to get attention. This update was quite reasonable, although I must admit to being a tad disappointed that the record Q2 performance referred to within the Blog post above did not extend into Q3. Revenue for the nine month period to end Q3 was 7% ahead of the same period last year, within which Mincon product sales were 5% ahead, and third party product sales were 15% ahead. Revenue in Q3, 2016 was ahead of the equivalent quarter last year, but only marginally, due in part to some reorganisations below, and some flattening out in some geographies. Last year MCON disclosed its Q3 revenue was €19.3m. So if Q123 revenue gained 7% during 2016, and knowing H1 2016 revenue was €36.3m, I calculate Q3 revenue for 2016 was €19.4m. For the nine month period to end-Q3, 2016, year to date our gross margin has held at 41%, our operating profit margin at 14% and our profit before tax margin at 16%. This was helped by a favourable foreign exchange benefit. These compare to 41%, 15% and 14% respectively for the same period last year. The gross margin for Q3, 2016 was 41%, the operating profit margin was 16% and the profit before tax margin was 19%, the latter being helped by a positive exchange rate movement. These margin percentages — especially the 16% operating margin — do not look too bad to me given the subdued mining sector MCON serves. I reckon Q3 2016 operating profit was €3,099k (Q3 2015: €3,474k) and pre-tax profit was €3,680k (Q3 2015: €2,895k). Operating profit was down on last year, though that is because Q3 2015 enjoyed a freakish 18% operating margin. The positive exchange-rate movement added a sizeable c€600k to profit during the quarter. We continue to monitor our foreign currency exposures with a view to building some resilience into the relevant trading relationships of subsidiaries and third parties. At present this means working to match long term liabilities and assets. We have made substantial foreign exchange gains this year, which, while not damaging the Group, do underline the trading risk. I think this translates into MCON having enjoyed the upside to FX movements, the group now realises it could easily go the other way. As such, the firm now wishes to match overseas assets and liabilities to perhaps produce less in the way of income volatility. We finished the quarter with net cash of €35.1 million (31st December, €38.6 million) having invested €3.5 million on capital equipment and having met the interim dividend, €2.1 million, in the quarter for a total of €4.2 million in dividends this year. Of the €5 million absorbed into working capital this year, some €2.2 million has gone into inventory and this should unwind through the rest of the year. However, €2.6 million has been absorbed in debtors, and much of this with specific debtors that are on a work out with the Group. While we believe we have provided for any currently foreseen losses on these accounts, we should have better visibility of the outcomes on these debtors by the year end. That second paragraph sounds ominous. I have always commented upon MCON’s hefty working-capital demands and the text does suggest there may be a few bad debts on the horizon. I am also not sure what MCON means by debtors being on a “work out“. €5m being absorbed into working capital so far this year is a large amount — for perspective, earnings in 2015 were €8m. Capital investment has stepped up to nearly €4 million approved in the year to date as we add to our ranges of hammers and bits. Approximately 80% of this expenditure has gone onto the five factory floors in plant and machinery, and about €3.2 million (to Q3, 2015 €726,000) net of disposals has already passed through the cash flow as we approach the end of the first year of a three year plan. I can’t recall ever hearing about a “three year plan” before with this capex. We have faced the “make or buy” decisions over the last few years as we develop our sales strategy. Acquisitions have offered poor value at times, in our opinion, and we have responded by building out our direct sales teams, adding to our engineering team and our productive capacity and extending our product ranges. My best guess at a trailing operating profit is €10.0m, which I suppose with ‘one-off’ costs added back could be closer to €10.4m. The latter figures converts to £9.1m at £:€1.14. With MCON’s H1 tax rate at about 19%, earnings could presently be £7.5m or roughly 3.6p per share. 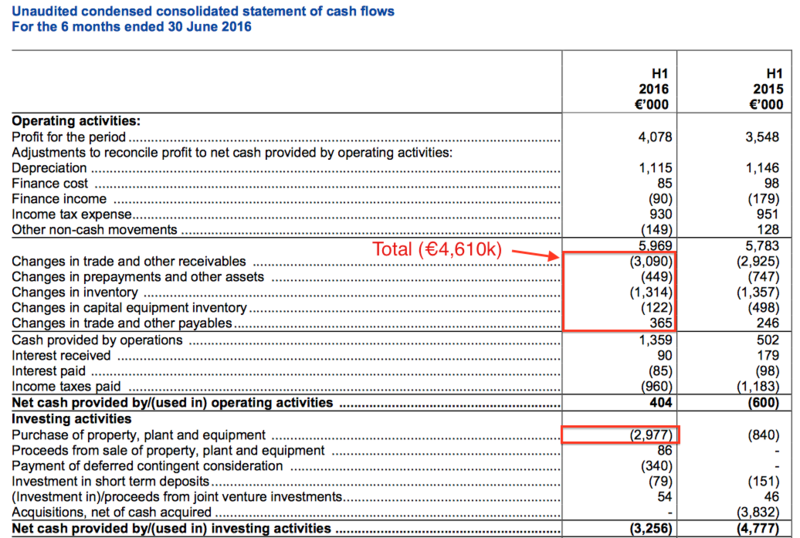 Subtracting a €6.3m potential acquisition earn-out from the stated €35.1m cash position, surplus cash looks to be €28.8m (£22.1m). Then subtracting that surplus cash from the £152m market cap (at a 72p share price), my estimate of MCON’s enterprise value (EV) is £129m or 62p per share. Dividing that 62p per share EV by my 3.6p per share EPS guess therefore gives a multiple of 17.3. That does not look an obvious bargain to me.